Fried onions or French fried onions are a popular snack food, garnish, or vegetable accompaniment to various recipes. Common fried onions are cooked by basic pan frying or sautéing of sliced onions. This produces a fairly soft cooked onion, which may brown some from a Maillard reaction, depending on the length of cooking and the temperature. The Philadelphia cheesesteak is a hot sandwich commonly served with sautéed onions, and they are half of the dish called liver and onions. In the Middle East Mujaddara is a dish made of lentils and rice topped with fried onions. In Indian cuisine, fried onions are one of the key ingredients for the rice dish called biryani. If the much higher temperature, immersive, deep frying is used, this prepares the onions in a manner similar to that of French fried potatoes. Smaller and irregularly shaped (from being deep-fried until they are crunchy) onions are an integral part of the American dish Green bean casserole. They are sold prepared by some companies, for example Durkee and French's French Fried Onions are brands sold in a paper canister. 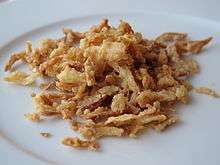 Freshly made crisp fried onions may be used as garnishes in some restaurants. Large, often ring shaped batter coated deep-fried onions are often associated with fast food and casual dining. Examples include onion rings and blooming onion. Wikimedia Commons has media related to Fried onion. ↑ Dull, S.R. ; Fowler, D.L. (2006). Southern Cooking. University of Georgia Press. p. 108. ISBN 978-0-8203-2853-9. ↑ Wilbur, T. (2006). Top Secret Restaurant Recipes 2: More Amazing Clones of Famous Dishes from America's Favorite Restaurant Chains. Plume. p. 35. ISBN 978-0-452-28800-3.